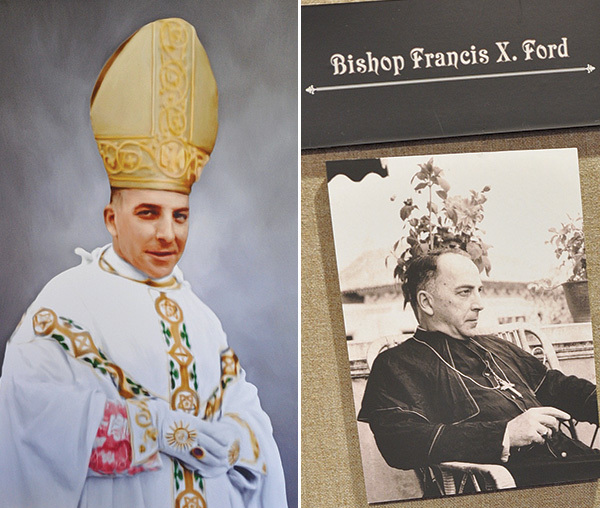 Someday, the late Bishop Francis X. Ford will be declared a saint, but no one thinks it will happen soon. I had a chance to learn more about Bishop Ford and to talk with Father Finch during a recent trip up to Maryknoll, near Ossining, N.Y.
Maryknoll had mounted a photo exhibit about its candidates for sainthood and there was plenty to see about Bishop Ford, who was baptized at Sacred Heart Church, Adelphi St., Fort Greene, and attended St. Joseph’s School, Prospect Heights, and St. Francis Prep, Brooklyn, before beginning studies for the diocesan priesthood at Cathedral College, Brooklyn. His parents were married in 1877 at St. James Church, Downtown Brooklyn. His father was the publisher/editor of the second oldest Catholic newspaper in the U.S., The Freeman’s Journal. 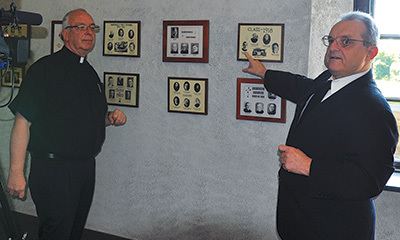 It was after hearing Father James A. Walsh speak at Cathedral College about the newly founded missionary society, Maryknoll, that he decided to enter Catholic Foreign Mission Society of America, its formal name. He was the first seminarian to be accepted by Maryknoll when he applied in 1912. Ordained in 1917, the following year he was among the first band of missioners sent to China. Ford was ordained as the first Bishop of Kaying in 1935 and was present in China during some of its most tumultuous times. After surviving the Japanese in World War II, he wasn’t as fortunate when the Communists took over the government. He was arrested in 1950 on trumped up charges of espionage. He was publicly humiliated and ridiculed as a spy. He eventually died in a Chinese Communist camp near Canton in 1952. The Communists expelled Christian missionaries and it wasn’t until the country opened its doors to the world during the Nixon Administration that we learned the Church was alive and well in China. Bishop Ford is a hero of the Church in China. His home Diocese of Brooklyn has been working on the process of recognizing him as a saint. The late Auxiliary Bishop Ignatius A. Catanello was the postulator of the cause. Bishop Catanello’s death in 2013 created a void that was filled by Father John Vesey, a Brooklyn priest who recently returned from teaching with Maryknoll in China. These days, he often can be found in the Maryknoll archives, researching the life of Bishop Ford and the virtue he displayed while serving in China. The Vatican may move slowly out sensitivity to the Chinese government. Witness the fact that Pope Francis has not appointed a single bishop to mainland China since his election to the papacy. We know that Bishop Ford was a martyr for the faith and that qualifies him for sainthood. It just may take a little while longer for the Church to officially recognize it. One of our First Mryknoll Missioners to go to China and I hope soon will become a Saint in the Roman Catholic Church soon because he is an inspiration to all Missioners. I know that you have a desire to publicise the Brooklyn side. Maryknoll was/is dependent on Brooklyn but if you wish to be more correct there were three priests in the Society Fathers James Anthony Walsh, Thomas Frederick Price, John Ignatius Lane but before the seminarians arrived there was another young man from Brooklyn Thomas McCann who became the first Maryknoll Brother in the Society.